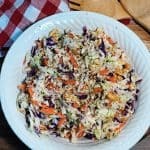 This twist on the classic coleslaw is the perfect side dish to take along for potlucks, picnics, or barbecue. 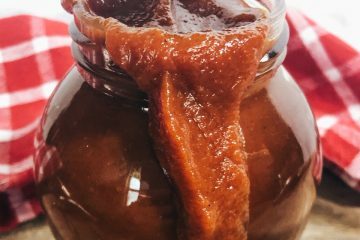 It’s super easy to throw together and has a unique flavor because of the red wine vinegar salad dressing used. Use your favorite mayo. 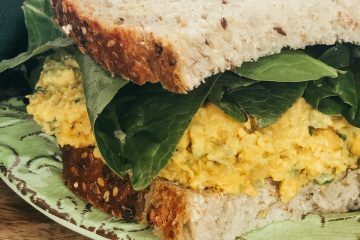 This is a vegan food blog and so the mayonnaise used in this recipe is a vegan mayo. Add in some crunchy salted peanuts, and you will have a tasty unique side dish you can be proud to take to any potluck dinner! 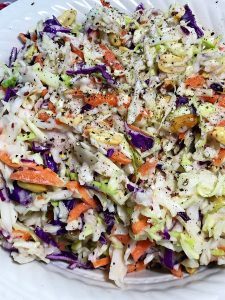 Two bags of shredded coleslaw mix – I like to use a tri-color mix, your favorite red wine vinegar salad dressing, your favorite mayonnaise – I use a vegan mayonnaise and salted roasted peanuts. So I have this friend and work colleague who has a reputation for being a fantastic cook. Everything she prepares and brings in to share is quickly devoured. I try to pay special attention to what she brings – even if I can’t eat it (yep, the vegan thing). 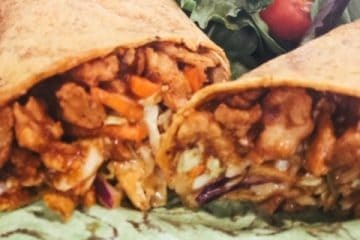 She’s always good to share her recipes, and even helps me try to figure out how I can switch out and sub ingredients to make her dish vegan-friendly. I was especially interested when she brought in this unique red wine vinegar coleslaw. When she told me how easy it was to prepare, I knew I would soon be giving it a try. Well, I didn’t know how soon that would be! The very next day I got a text from a friend about a pop-up surprise birthday party. And please, bring a side dish. Yay! I had just the perfect side dish in mind:) The coleslaw was super big hit at the party. Everyone raved about it. I didn’t mention the vegan mayo used, but did mention the peanuts! (You’ve got to disclose that!) 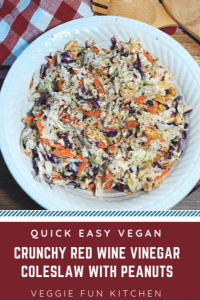 I hope you enjoy this red wine vinegar coleslaw as much as my friends and I did. 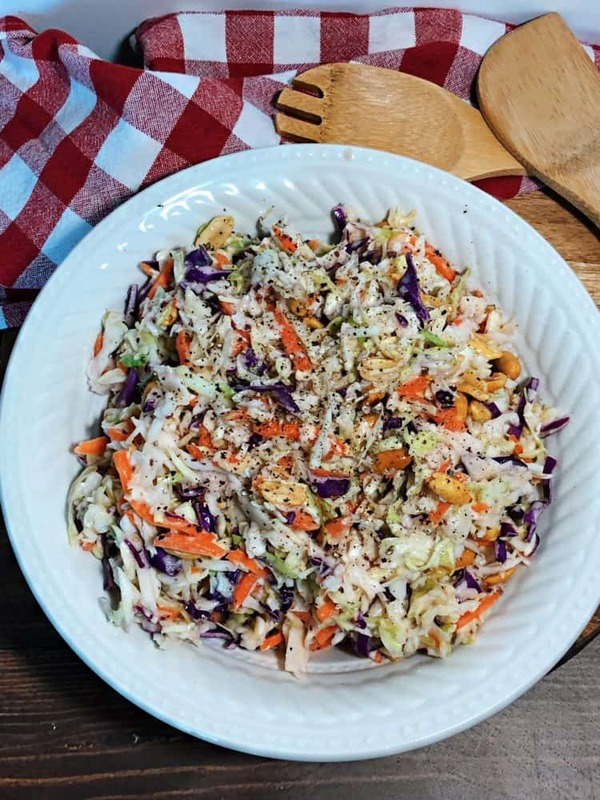 This coleslaw is super easy to throw together with just these few simple ingredients. 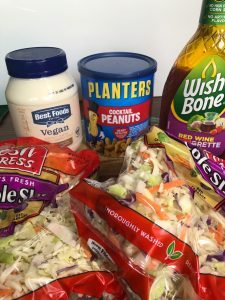 These are all the ingredients you will need for the Red Wine Vinegar Coleslaw with Peanuts. It’s so easy! 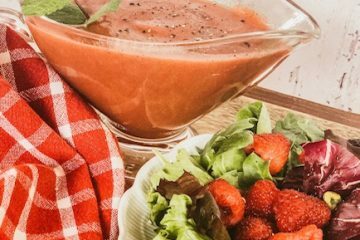 Use your favorite red wine vinegar salad dressing. I used Wishbone. That is what my friend recommended. Plus, at the time of this writing, it looks as though this salad dressing is vegan. 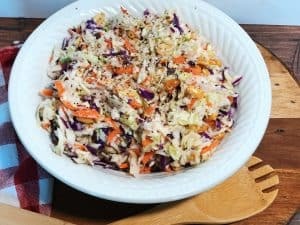 I like the tri-color coleslaw mix. 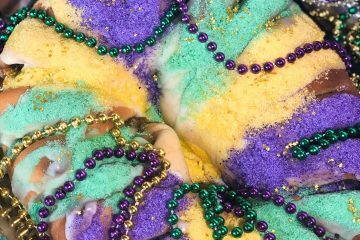 The orange carrots and purple cabbage really make it pop. Use a mayonnaise of your choice. This is a vegan food blog so of course, we are using a vegan mayo. 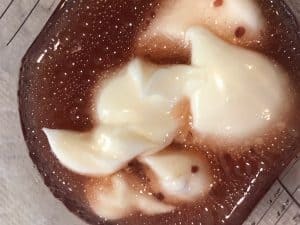 Whisk together the mayo and red wine vinegar salad dressing till it is smooth. Then pour it on. 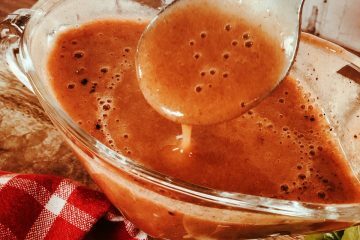 Whisk the vegan mayo and red wine vinegar salad dressing together and pour on. It’s that easy! Roasted salted peanuts are the best and really give the red wine vinegar coleslaw a super added crunch. This recipe will not work great for meal prep. The red wine vinegar dressing and salt from the peanuts will wilt the coleslaw fairly quickly. 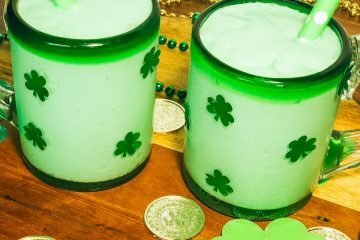 It does mix together fast so save the mixing till just before you are going to take it and serve. You must disclose to people you serve that this coleslaw contains peanuts. You’d think it would be obvious with the big chunks of nuts visible. Just don’t take a chance. Safety first. 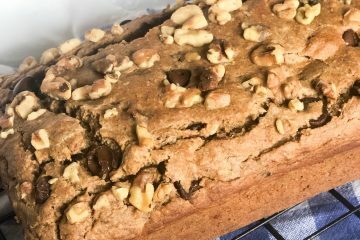 Most of the recipes on this blog are healthy and oil free. Sorry, not this recipe. It’s the tastiest easiest coleslaw I’ve ever made though. Try it; you’ll like it! 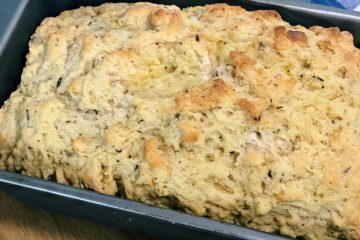 And I promise that I’ll soon be working on a healthier (but probably not as easy) version of this recipe. *Affiliate links* I am an Amazon affiliate which means that clicking on and purchasing through one of these links might provide Veggie Fun Kitchen with compensation at no additional cost to you. This red wine vinegar coleslaw is extra crunchy with added salted peanuts and extra delicious. 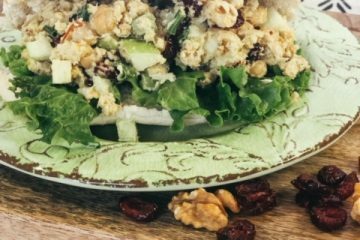 It is easily made with a coleslaw mix, red wine vinegar dressing, mayo, and roasted salted peanuts. Take this to any potluck, barbecue, or picnic. Put coleslaw mix into a medium/large serving bowl. 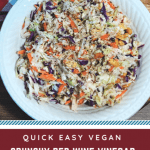 Whisk together the red wine vinegar salad dressing with the mayonnaise until it is well mixed. Toss dressing together with coleslaw mix. This recipe contains peanuts. You must disclose if you serve to others.